Happy New Year Everyone!! Hopefully 2013 will be a wonderful year for everybody!! Anyway, on my last post, I had discussed my intention for integrating wood and resin. In all honesty, the dog paw in the small, wooden box was exhausting to pull off. The hand carving of the paw about broke my hand as I did it with a Dremel freehand…big mistake. However, the possibilities of what I can do with the integration of wood and resin has been brewing and building in my mind ever since. Thanks to a very generous Santa Clause this year (my dear hubby), I now have a brand new Ryobi Scroll Saw and a brand new NICE camera to use to document my progress. For those of you that don’t know what the capabilities of a scroll saw are…stay tuned; it’s difficult to explain but can easily be shown in pictures and videos. Both of which I fully intend to have in my blog entries this year. Just as before, I am a working woman and time to dedicate to my craft is brief so blog posts aren’t going to be very frequent for the foreseeable future; but I’ll do my best. I’ve very excited about the new direction I’m about to embark on and the cool little workshop I now have in the basement!!! Thanks for the support through this and hopefully we can have another inspiring year!! After much consideration and thought, I had found myself in a rut. I enjoy crocheting and knitting but it’s not that fun to do when it’s hot as hell outside and oppressively muggy inside. I enjoy creating the wooden boxes, that I’ve blogged about previously, but that project had also run it’s course. Woodburning and painting was fun but “been there, done that”, I needed to find another direction to take my crafting…I was in a rut. While surfing around the net one night, I stumbled upon the art of working with resin casting on You Tube. The techniques documents were primarily for jewelry (pendents and bracelets mostly) and while it’s completely charming to imbed candy into clear resin and wear it around your neck for eternity…it really wasn’t my thing. Then I found a video of a man that would put colored resin inlays into the neck of guitars; while interesting…I don’t play much anymore so that didn’t help either. But I had a moment of enlightenment; is it possible to inlay colored resin into wood, or better yet…a wooden box? So my quest for knowledge began. I looked up everything I could on the internet about resin, casting resin, molding resin and coloring resin. Again, it was mostly geared towards making jewelry (other than my wedding rings, I rarely wear it) so I began looking for resin inlay techniques for wood. Amazingly enough, all I found was a single Acrobat document that was produced in 2009 for a woodworking magazine. I was pretty much on my own for this one. I began gathering the supplies that I would need to start my experiment; luckily I already had most of them (paints and colorants) but purchased the actual resin and mixing cups from a craft store. The syringes were a bit tricky (thank God I don’t look like an intravenous junky) but I found a pharmacist that sold me 16 syringes for 10 cents a piece because they were expiring their useful date for medical use and they were going to be pitched anyway. I had a little wooden box, that I’d purchased for a dollar, that had a lid that was about 1/2 inch think and perfect for my inlay experiment. I got into my vast supply of clip art books and found a simple dog paw pattern that fit nicely on the lid. After transferring the clip art onto the lid, I used a Dremel to cut a recess of about 1/4 inch into the lid (I didn’t want to cut through the top because the resin would run out). After the cutting was finished, I made sure that the lines were clean so after the excess resin was sanded off, a clean inlay would remain. After blowing off the sanding dust, I proceeded to mix the resin (you have to combine it with a catalyst in order for it to harden) and it stunk to high hell. I didn’t want to just cast clear resin so I had some silver/grey powdered mica that I mixed in. After I combined the mixture to my satisfaction, I used a syringe to fill the recessed areas on the lid of the box. I actually overfilled the cut out area because there’s a slight shrinkage upon the resin curing (I’d only read about it…no actual experience in how much shrinkage would take place) and the syringe made it a very clean and tidy process; I intended to sand the resin down to be flush with the lid anyway once it was cured. After the filling and the curing (I put the box with the un-cured resin under a lamp that put out some heat) and waited for 24 hours. The next day, I hand sanded the box until the resin was flush and smooth. The one disappointment I had was that the resin was quite dull and blended with the matte finish of the box, I was hoping for a glossy finish. Easily solved! I dug into my collection of paints and finishes and found a bottle of Triple Gloss Acrylic that I painted on to create the shine. Overall, I’m encouraged and actively working on my next project…of course I will blog about it. Keep an eye open on my blog; more good things will be posted soon!!!! First off, thank you to my friends that have commented on my blog!!! I’m having a heck of a time trying to figure out how to respond to your replies (still REALLY new at this!) so please forgive, I’ll keep working on it. 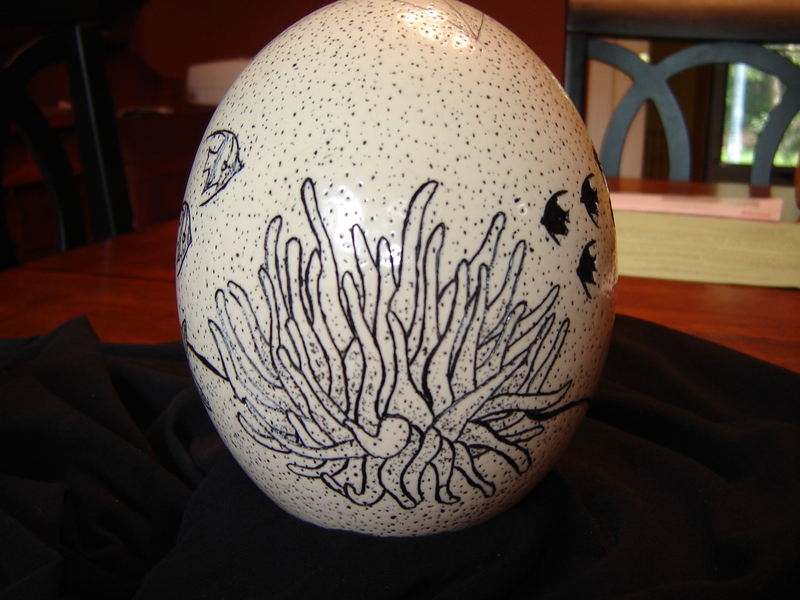 I’ve gotten such an amazing response to the ostrich egg that I had in my previous post, I thought that it would be a good idea to show the first emu egg that I carved about 5 years ago. 1. 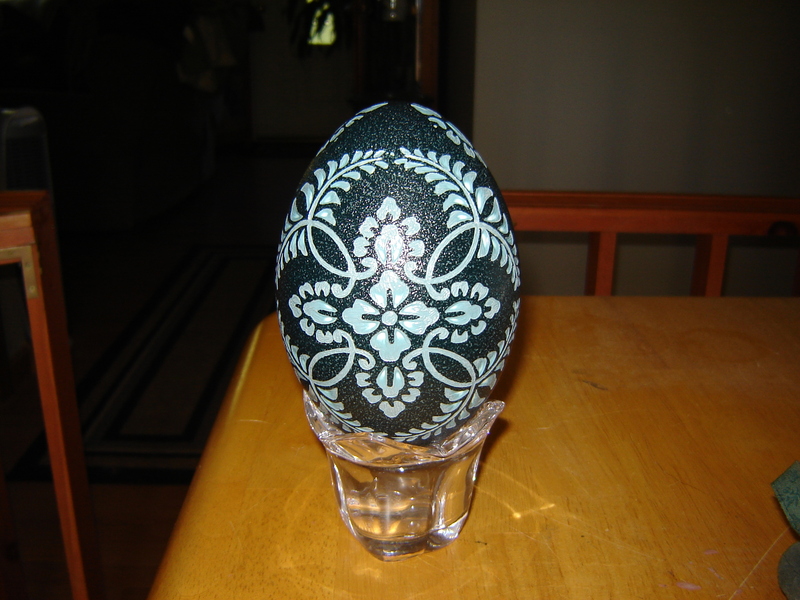 This egg is not painted. It is naturally emerald green on the outside with and aquamarine blue layer and a very white layer underneath still. It takes quite a bit of patience (and a steady hand) to relief carve the image that you see. 2. The egg shell itself is about .1 mm thick. I’m lucky I’ve never broken one but it still takes a gentle hand to do. 3. The egg itself is the exact shape and size of a Nerf football but feels like cool porcelain to the touch. 4. I buy my egg shells on EBay. I don’t have a big enough yard to keep emu’s and ostriches. Okay, now that I have the basic facts out of the way…this is how I do it. You really don’t have to have any free hand drawing skill, only the ability to trace existing patterns and have a steady hand when using the drill. That does take some practice. First, you get an egg. Like I said, I get them from EBay. The outside emerald green varies from egg to egg. I prefer the darkest outside color because I think it compliments the aquamarine beneath it better. But, I’ve seen eggs that are almost a sage green on the outside to a pale green. I still like the darker ones. Then, I decide my pattern. I own A LOT of clip art books! I get many clip art books from Dover Publications because the patterns are very clean and they (mostly) come on a DVD. I prefer the DVD’s because I can size the patterns for my own needs. I’ve also been known to use free clip art from the net. I don’t use the copyrighted images that can be found on the internet because I think it’s stealing and respect the original artists for their effort and creativity. 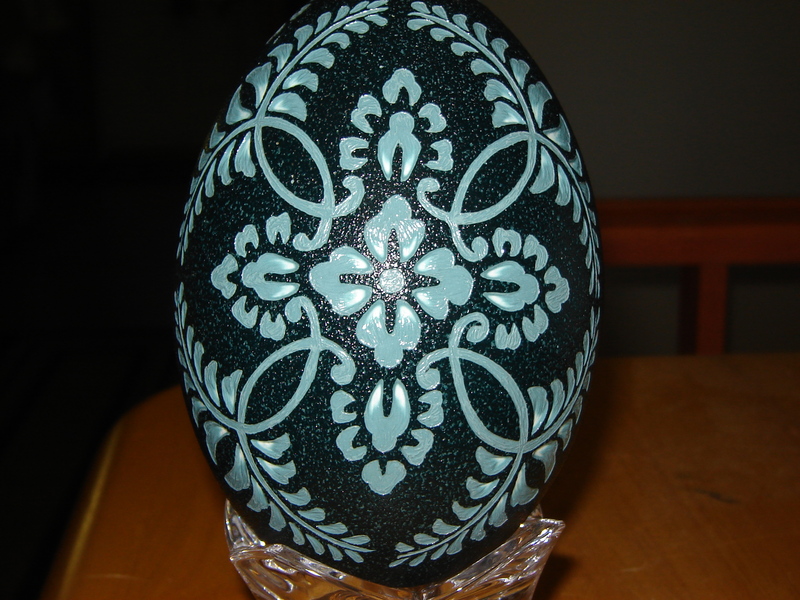 Once I decide on the pattern, I print it out and decide the best way to get the image on the egg. It’s challenging to get a two dimensional image on a three dimensional surface so sometimes I print the patterns onto adhesive backed paper (full or half page label paper that you can get almost anywhere). When I get the stickers (that’s what they are by the time I’m done with them) on the egg, I do a rough outline carving of the pattern with the drill. Once that’s done, I take the cut up stickers off and finish the egg. I’ve also used graph paper to transfer images; white graph paper for the emu eggs (you can’t see regular graph paper because the egg is so dark) and the standard graph paper for ostrich and goose eggs. Once the egg is completely finished, I wash it off really well and then allow it to dry completely. When the egg is blown out, a hole about a 1/4 inch remains at the bottom. I was advised not to cover it up because you want to keep the air flowing to the inside so it doesn’t deteriorate. 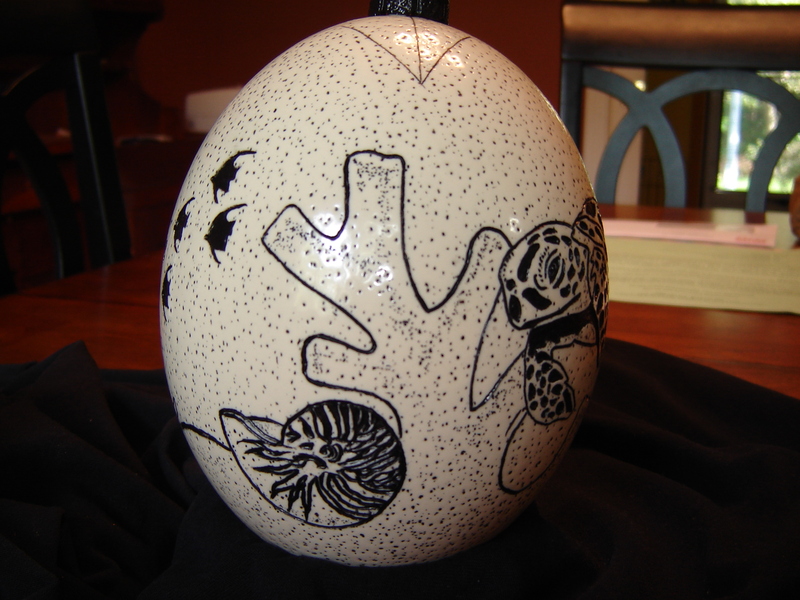 I also spray the outside with a clear, matte finish sealant so dust doesn’t stain the egg when it’s on display. If kept out of direct sunlight, these eggs can last forever!! So, there you go. Now you know more than you ever wanted to know about carving an emu egg. I’m still in awe by the delicate beauty they have when completed. I hope you enjoyed my entry!!! I have been known to get very bored from time to time. Unlike several people I know, sitting in front of a computer or the TV just isn’t an option for me… I can watch TV but my hands have to do something other than driving the remote. I began my quest for “weird things to do with eggs” about 5 years ago when I first came to Cape Cod, not knowing anybody and a fairly recent widow (due to a strangely traumatic event; I may discuss some day but not today). Since I didn’t really have anywhere to go, other than work, I relished in the new freedom of watching whatever I wanted on TV!! The next step was to find the materials I required to fuel my new obsession. I hit the internet. Not expecting to find much on it, I found more than I expected. There were solidly 30 web sites that displayed varying levels of talent and techniques that fueled my imagination. So, I had an idea but nothing to express it with. I surfed to my “old faithful” fallback of everything wonderful; I went on Ebay. Who would have thought that you could by empty and clean ostrich egg shells on Ebay? I certainly didn’t but I was pleasantly surprised to find that not only were they for sale; there were several people selling them! So, I bought two. Not having any clue as to what to do with them, I still bought them. Then I needed a means in which to create the act of carving. I referred back to the legitimate web sites for carving and the most obvious thing was that extracted for me was that a Dremel was the worst thing to use due to the low RPM’s (roughly 40,000 per minute) and the vibrations created by that. Vibration is not good when you’re carving AN EGG!! I ended up buying a Turbo Carver (my own personal dental drill at 125,000 RPM’s!!) that had a little compressor that came with it. Fairly portable and user friendly, according to the web site. The drill bits were included and there were clear instructions enclosed…again, stated by the web site. It took about 3 weeks for everything to arrive. I was so excited that I made sure to tell the 8 people that I mildly knew through work (they were all guys…I didn’t get the desired effect that I hoped for from them) and kept looking at the web sites when I had spare moments. I learned that ostrich eggs weren’t the only types of eggs that could be carved. Emu eggs could also be carved! I wasn’t quite sure of what an emu was but a little research answered many questions. 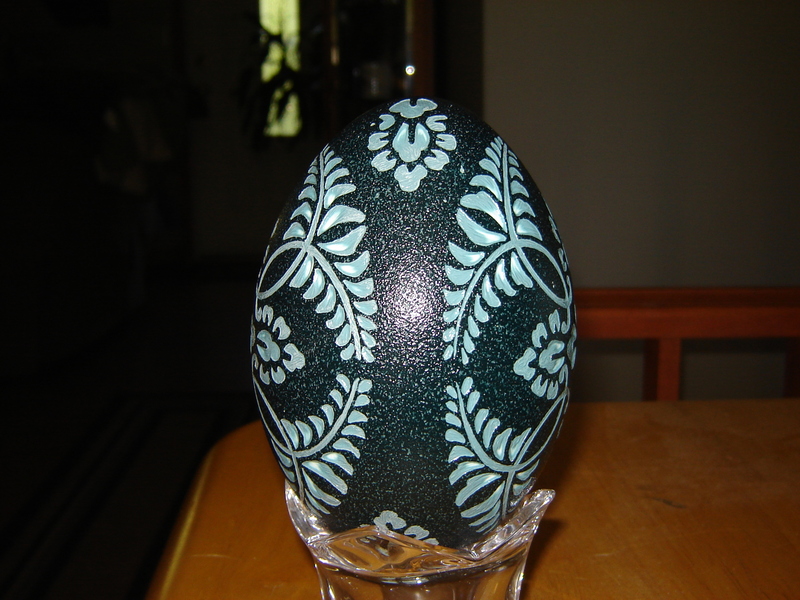 Instead of the standard “white” color of many eggs, an emu egg was naturally emerald green on the outside. Once you went through the dark green, a beautiful shade of turquoise blue made itself known. I admit, the contract between the two was gorgeous! The big surprise was that under the turquoise was the whitest white that was powdery and very thin. Great skill was entailed in carving that. Finally, everything arrived! 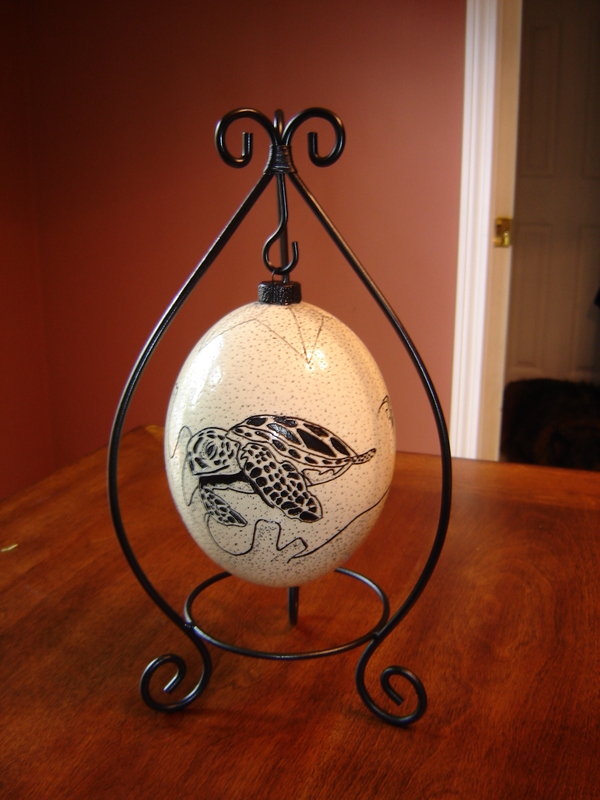 I had the drill, compressor and two creamy white ostrich eggs that felt like porcelain to the touch (they were much more stout than I thought they would be…I guess they would need to be tough in order to hold up a 250+ lb bird!). I also had a million ideas of what I wanted to do. So, what did I do first?!? I put everything on the dining room table and looked at it for two weeks before I touched it again. I guess it was a little intimidating for me at the time. The pics attached to this entry show my latest creation. I find that after I finish one, I can’t pick up another egg project right away. I don’t know if it’s because it’s such a tedious process or just because I get sick of it. But I’m sure I’ll pick one up again sometime soon because I have two more ostrich eggs sitting on my shelf waiting to be…changed. I guess I need to start putting them on Ebay again, a woman only needs so many eggs in the house. I know that this entry is different from my others but this is my interest for the day. I hope you enjoy it!! !